The Crossfire 2 utilizes four micro adjustable buckle closures, with indented memory-regulation straps. The buckles, straps and retaining clips are easily replaceable. The buckles have just one fixing point (bya screw), which allows them to be easily replaceable. You will note that all four buckles work independently from each other. This system allows the boot to fit all shapes of feet and lower legs independently making each boot that much more comfortable for each individual rider. 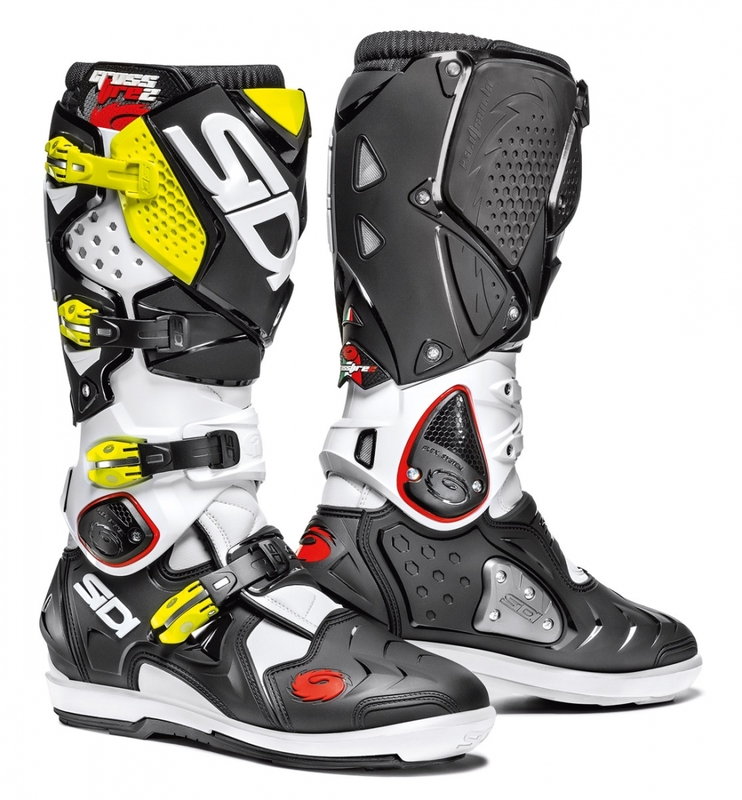 The Crossfire 2 maintains the key feature of the Sidi Flex system, with its two articulated joints. The first lower one, on the ankle, improves leg flexation and allows for a more natural and correct position on the foot pegs. All bolt on components of the Crossfire 2 are replaceable. The upper pivot, on the bootleg, improves the boots flexibility and the adjustment of the bootleg itself. In this way, the rider can adjust the boot strap at the calf to his personal preference and achieve an improved fit. A rigid replaceable nylon insert has been added to protect the inside of the boot in case the rider?s foot slides o ff the foot peg or if it slips off the kick-starter. The insert is replaceable by unscrewing the 4 screws. The front part of the foot of the boot is entirely covered by plastic protection panels. The toe is protected by a steel piece, not available on the SRS version. Enhanced heel construction. The anatomically shaped heel is manufactured in PU. Its particular form was evaluated and implemented to provide more safety to the foot in case of twisting. The boot leg has a replaceable inner polyurethane plate with a heat resistant rubber insert to protect the leg from exhaust heat, wear and tear. The calf plate features an inner double adjustment, which allows to widen the circumference of the boot and accommodate even the wider calves. The boot leg (upper) is entirely assembled with screws, thus it is stitch-free and totally replaceable!